Ocean transport is a cheaper means of haulage (carrying of load) of bulky material over long distances from one continent to another. Northern Atlantic Sea Route links North-eastern U.S.A. and North western Europe, the two industrially developed regions of the world. The foreign trade over this route is greater than that of the rest of the world combined. One fourth of the world’s foreign trade moves on this route. It is, therefore, the busiest in the world and otherwise, called the Big Trunk Route. 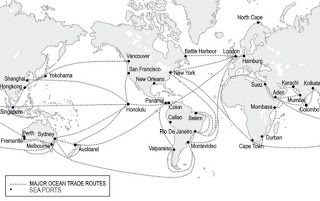 Port Said, Aden, Mumbai, Colombo and Singapore are some of the important ports on this route. The construction of Suez canal has greatly reduced the distance and time as compared to the earlier route through the Cape of Good Hope. Mediterranean–Indian Ocean Route route connects the highly industrialised Western European region with West Africa, South Africa, South-east Asia and the commercial agriculture and livestock economies of Australia and New Zealand. Before the construction of the Suez Canal this was the route connecting Liverpool and Colombo which was 6,400 km longer than the Suez Canal route. Cape of Good Hope Sea Route is another important one across the Atlantic Ocean which connects West European and West African countries with Brazil, Argentina and Uruguay in South America. North Pacific Sea Route links the ports on the west-coast of North America with those of Asia. These are Vancouver, Seattle, Portland, San Francisco and Los Angeles on the American side and Yokohama, Kobe, Shanghai, Hong Kong, Manila and Singapore on the Asian side. South Pacific Sea Route connects Western Europe and North America with Australia, New Zealand and the scattered Pacific islands via the Panama Canal. Honolulu is an important port on this route. Suez Canal had been constructed in 1869 in Egypt between Port Said in the north and Port Suez in the south linking the Mediterranean Sea and the Red Sea. It is a sea-level canal without locks which is about 165 km and 11 to 15 m deep. Panama Canal connects the Atlantic Ocean in the east to the Pacific Ocean in the west. The Canal is about 72 km. long and involves a very deep cutting for a length of 12 km. It has a six lock system and ships cross the different levels (Watch Video 26 Meter up and down in Gatun Lake) through these locks before entering the Gulf of Panama. It shortens the distance between New York and San Francisco by 13,000 km by sea. Rivers, canals, lakes and coastal areas have been important waterways since time immemorial. Boats and steamers are used as means of transport for cargo and passengers. Very heavy cargo like coal, cement, timber and metallic ores can be transported through inland waterways. Rhine Waterways flows through Germany and the Netherlands. It is navigable for 700 km from Rotterdam, at its mouth in the Netherlands to Basel in Switzerland.This waterway is the world’s most heavily used. Each year more than 20,000 ocean-going ships and 2,00,000 inland vessels exchange their cargoes. It connects the industrial areas of Switzerland, Germany, France, Belgium and the Netherlands with the North Atlantic Sea Route. Danube Waterway is important inland waterway serves Eastern Europe. The Danube river rises in the Black Forest and flows eastwards through many countries. Russia has a large number of developed waterways, of which the Volga is one of the most important. It provides a navigable waterway of 11,200 km and drains into the Caspian Sea. The Great Lakes of North America Superior, Huron Erie and Ontario are connected by Soo Canal and Welland Canal to form an inland waterway. The Mississippi-Ohio waterway connects the interior part of U.S.A. with the Gulf of Mexico in the south. Large steamers can go through this route up to Minneapolis.